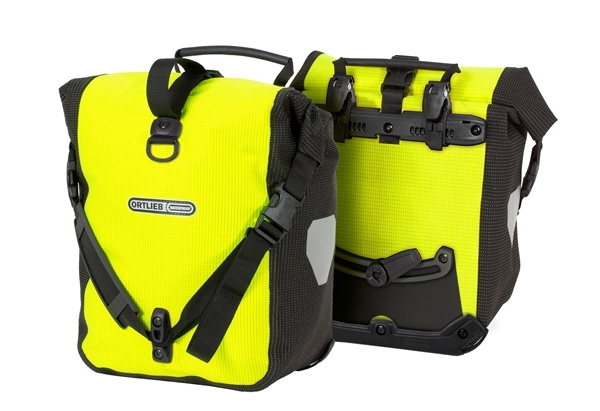 Product information "Ortlieb Sport-Roller High Visibility QL2.1 neon yellow - black reflex"
Bright on the move with the Sport-Roller High Visibility bags from Ortlieb! Because not only the attached reflectors improve the visibility of the cyclist, but the complete bag. How it works? The waterproof PU-coated Cordura fabric is completely interlaced with a bright reflective yarn. So the bag not only looks sporty, but is also a highly effective safety measure in road traffic. The practical zippers also seal the sports scooter waterproof and provide ample storage space for all important travel utensils. Related links to "Ortlieb Sport-Roller High Visibility QL2.1 neon yellow - black reflex"
Customer evaluation for "Ortlieb Sport-Roller High Visibility QL2.1 neon yellow - black reflex"